51st Street Reconstruction - 03, originally uploaded by John Michlig. 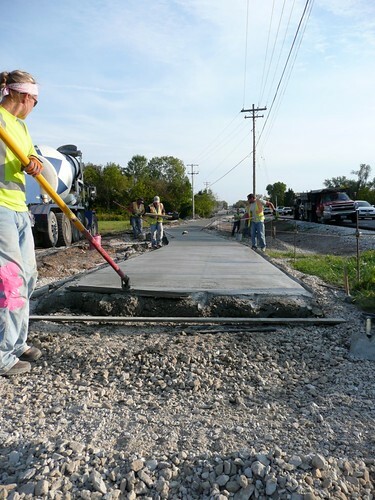 Reconstruction of 51st Street in front of Franklin High School begins in earnest. Click on the title in the caption above to see a full set of photos on Flickr. The $27.5 billion isn't targeted to rebuild streets at the heart of older cities and towns, the cherished settings for Memorial Day parades and holiday light displays. No, the money will primarily go to projects that government knows best — the expansion of wide, motor-vehicle-only highways that go hand-in-hand with energy-wasting sprawl. This follows the earlier stimulus bill that favored massive highway projects, including a batch of expensive "highways to nowhere" that an examination by the Infrastructurist website concluded "make no sense." The new bill does reserve $8.4 billion for transit and $800 million for Amtrak. But just when U.S. real estate markets are turning to Main Street and traditional neighborhood design, Congress throws $27.5 billion at the infrastructure — road widening — that supports sprawl. Whether the setting is small towns like Guilford, older suburbs like West Hartford or bigger cities like New Haven, the traditional Main Street in Connecticut and other states is proving to be a model around which to build livable and energy-efficient communities. A report by economist Joseph Cortright for CEOs for Cities is the latest to find homes within walking distance of shops, schools and other amenities commanding significantly higher prices than sprawl counterparts. And in the world of commercial real estate, the hot trend — named by Time Magazine as one of "ten ideas changing the world" — is "retrofitting suburbia" with walkable, mixed-use development. None other than Tyson's Corner, Va., the largest sprawl commercial complex in the country, is due for a multibillion-dollar urban makeover complete with traditional main streets. Evidence shows these networks save money — and they save lives. Research by engineering professors Norman Garrick of the University of Connecticut and Wes Marshall of the University of Colorado-Denver reveals that traffic injury and fatality rates are three times higher in California cities with sprawling streets than in those with compact, connected networks. Brookings-backed research from the Center for Neighborhood Technology shows that highway-served sprawling areas in region after region have the highest household transportation costs and highest per-capita carbon emissions. Each months, residents of walkable, transit-served neighborhoods save hundreds of dollars in average transportation costs. 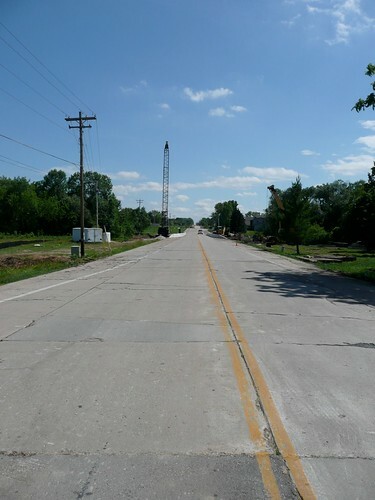 Reconstruction of S. 51st Street from W. Drexel Avenue to W. Puetz Road - 60 percent plan review and policy decision relative to additional funding in addition to the American Reinvestment and Recovery Act (ARRA) funding. This issue was this: The stretch of 51st Street in front of Franklin High School is due for repaving. Despite its heavy use - and single entry-point to the school - it has been without non-vehicular features (pedestrian and bike access) for as long as the high school has been there (approximately 1964). To simply re-do it as it is would be a lipstick-on-a-pig project, to be sure. How did we get to this point? You may remember that, during the misguided "widen 51st Street" debacle, certain council members made a point of repeatedly saying that Franklin had "pretty much zero chance" of getting stimulus - aka American Reinvestment and Recovery Act - funds (city engineer Jack Bennett: "A chance in a million"; alderman Steve Taylor: "No chance in hell"; alderman Steve Olson: "We will not receive any federal dollars" ), therefor it was senseless to sweat the details. These projects were chosen without public input based on what the city had in its medium range plans. The 51st Street item was particularly troubling in that it proposed a by-default widening the road; city administrators can deny it all they want, but the only plan filed at that point was indeed a default widening plan. I addressed these auto-centric proposals in a post entitled "Common Council Tonight: Slouch toward mediocrity or reach for excellence? ", which includes some background on how the projects were chosen. American Recovery and Reinvestment Act funding should not be used to expand a system of roads that do not provide safe travel for people who are walking or bicycling. Too many Franklin streets are designed wide and fast, without sufficient sidewalks, crosswalks or bicycle lanes. We, in fact, CREATE traffic with huge roads and no alternative. Now we have an opportunity for a new approach. there's not a lot of time. We currently have little or no consideration given for the safety of older people, children, or people with disabilities. ... I fear that Franklin seems content to ignore opportunities to increase connectivity and instead continues to encourage volume and throughput. I have a list of almost 600 Wisconsin bicycle and pedestrian projects funded or co-funded by the federal government from 1993 to 2007. Franklin does not appear once. We're going to have to address this. As for 51st street: There are clear and ready-to-implement street schemes that can be deployed there to make it a neighborhood amenity and increase commercial foot traffic. So let’s get on that. I was far from the only one to speak out. The council heard from many, many residents who sounded a common theme: Why always automatically widen roads? Why can't we walk or bike anywhere in this city? Why no connectivity? Don't we care about the safety of children and the elderly? It was a watershed moment made possible by the revelation that Franklin's stimulus requests threatened to be "business as usual" - auto-centric, and connectivity-be-damned. Responsive to the enormous amount of public input received, Mayor Taylor submitted a veto aimed at A) dismantling the poorly birthed project list and, B) constructing instead a list that addresses resident's concerns about safety, walkability, and accessibility. The reality is, is - and I'm going to say it - this meeting tonight is a monumental waste of time. This common council and you all have had your time wasted for the last three weeks. We will not receive any federal dollars. We do not qualify for federal dollars based on the criteria that now comes before us. So this action item, whether the mayor's veto is withheld or overridden is meaningless, just as my colleagues have said. The discussion that we're about to have is again a waste of time because we're not going to get federal dollars. We don't qualify. So, for my part I apologize that you're here. I'm glad that you're here; it's good to have people at common council meetings - you know, frankly, I get a little tired of seeing nobody here, so I'm glad you're here. But I think there are better things you could be doing with your time than worrying about a four-lane road that's just not going to happen. Fortunately, my district's alderman, Kristen Wilhelm, and Mayor Taylor disagreed with Olson ("we will not receive any federal dollars") and made sure public input was gathered and weighed prior to our application for funds. The discussions and meetings for which alderman Olson had such little regard resulted in the decision that the stimulus application would concentrate on 51st Street in front of the high school. Furthermore, we were able to learn the following: Listening sessions - more "monumental wastes of time"? - reiterated and made clear that neighbors are very, very concerned with making that stretch of 51st in front of the high school, at long last, safe and accessible for non-vehicular traffic. That message was delivered without ambiguity. Surprise: Franklin was granted a $1.5 million stimulus grant for 51st Street reconstruction. Another surprise: Turns out City Engineer Jack Bennett submitted Franklin's stimulus funding request with plans and budgeting that DID NOT include the bike and pedestrian paths that all parties assumed were part of any plan for the street. In other words, the default plan (no paths) would go into effect if additional city funding could not be appended to the project to supplement the $1.5 million stimulus grant. With the grant, the city's expense to re-do the road with paths would still be cheaper than doing a road without paths minus the grant. Still, money's tight, right? Long story short: On Tuesday night, this city took a huge step toward becoming a much more sustainable, attractive, and desirable community by altering the project slightly (putting off reconstructing the intersection, for instance) and preserving the pedestrian/bike paths that the community expects. A decision made for the citizens and not just their cars. Aldermen Wilhelm, Solomon, and Skowronski voted for the re-budgeting and preservation of the paths plan; Alderman Olson voted against; Aldermen Sohns and Taylor were not present. It's one small portion of the city, but a good, positive policy step; the people have been heard. Taken in combination with possible action by the Trails Committee regarding a Safe Routes to School program and its attention to 51st Street directly north of the intersection in question, Franklin is making strides toward improving its character and desirability by becoming more than simply a collection of subdivisions. This year, we have the rare opportunity to fundamentally reform our country’s broken transportation policy. With Congress soon to begin debate on a new transportation bill, now is the time to embrace a 21st century program. This includes dramatically boosting investment levels, taking a more balanced approach to transportation, and better serving the needs of metropolitan areas (where three quarters of Americans live). If a smart reform agenda is ultimately enacted into law, in coming years transportation investments will drive the nation toward economic recovery, greater energy security and much lower levels of greenhouse gas emissions. Right now, there are a number of helpful factors at play that combine to create this chance for meaningful reform: Obama has brought with him to Washington a strong interest in fixing and improving how we get around in this country; the highway trust fund is beginning to experience chronic shortfalls, spurring interest in overhauling the whole funding system; and it’s been nearly twenty years since the last substantial revision. But before we dismantle any policy and erect structures in its place, it’s worth understanding the history that brought us a sprawling federal institution comprising 108 different programs. Read the rest at 2009: A Defining Year For Transportation in U.S. » INFRASTRUCTURIST. So, my portions of the agenda come up - discussion items with no vote or motion attached, as I said in part 1, to get a read on A) where this commission stands on issues of smart growth and transit, and B) what this commission knows about issues of smart growth and transit. My feeling - if this hasn't been made clear already - is that Franklin needs to embrace smart growth principles and prepare for upcoming transit improvements, including rail in nearby Oak Creek, in order to remain relevant economically and as a community. In a postindustrial society, people need not go where the "factory" is; they choose communities based on desires such as: good parks, walkable neighborhoods, access to transit, vibrant public spaces, etc. That's what modern opinion polls clearly reveal. Now that the federal government has made transit and smart growth high priorities, companies will look to locate in areas where these factors have been addressed; there will surely be tax breaks and other incentives to encourage use of transit for their workforce. If you read part 1, you get an idea of the reaction I got to the notion of walkable neighborhoods, schools that can be walked to by kids who live mere blocks away, connected street systems, and the end of built-for-speed subdivision roads. There were sighs. Eyes rolled. Now, that's not to say that each and every member of the commission expressed annoyance. However, the ones who may have agreed kept quiet. On my tape, I can hear a commission member audibly scoff and chuckle as I describe the fact that teens have to get vehicles of their own simply to get to work and school - and teens are by far the most dangerous driving population. So, walkable communities and smart growth went down like a lead balloon. The transit conversation was constantly steered to remind me that "people don't want to ride buses." Or I was told about the time Franklin tried bus service to the industrial park, but only eight people rode the route and it was discontinued. But, I reminded him, I'm talking about preparing for the Madison-Milwaukee-Chicago rail line that will go right through our neighbor, Oak Creek. That means making business aware that we are aware of what's coming and that we'll be ready. A commission member mistakenly believed that I was hoping to bring rail directly to Franklin. "It seems improbable that Franklin, that's off the corridor between Chicago and Milwaukee, that straight line up, is going to be a 'sweet pick' for the federal government to spend money on, it just seems improbable. It's much more likely that they would choose a community like Oak Creek, through which tracks are already planned." Which is what I'd said earlier. So, we can't solve the classic "last mile" problem with a park-and-ride? Northwestern Mutual doesn't want ready access to Chicago and Madison? Furthermore, the commission member said: "I'm not going to go and try to change the behavioral habits of 1.5 million people in the Metro Milwaukee area. They are gonna do what they are gonna do. They like to drive. They're gonna drive." And yet that's exactly what has occurred in Minneapolis, to name just one metro area now served by rail. People changed their behavioral habits and made the MetroTransit Hiawatha train line part of their daily lives. Fortunately, the meeting ended on a high note, which I'll discuss in part 3. While the federal and state government declares smart growth mandates, regional rail, as well as grant and other funding opportunities for forward-looking transit-oriented development features, know this: The Franklin Economic Development Commission remains snuggled in 1996, ambivalent to the ground shifting beneath our feet. I have to credit Chairman Skowronski for getting all of my discussion items on the agenda; he knew they would be unpopular but gave them an airing nonetheless. The gist of what I wanted to do - besides ensure that we have a meeting longer than nine minutes - was take the temperature of the commission members regarding the economic benefits of smart growth policies and transit-ready development. The simple fact is this: The businesses - and families - of the near-future will be looking to locate in communities that are connected and committed to the new transit ideal; in the case of businesses, they will be rewarded by state and federal incentives to do so. That means planning NOW for the approaching shift. In Franklin's case, that basically means ensuring that we plan for "the last mile" connection between an Oak Creek transit station and us, as well as create better connectivity in new developments. We met in the Common Council chamber rather than the more discussion-friendly room we generally use so Alderman Steve Olson could use the projector to update the commission on 27th street. I got my first hint which way the wind was blowing when Olson showed a slide of a roundabout configuration (see above). Alderman Steve Taylor was in attendance and characterized their potential presence as "shoved down our throat by the DOT." Lots of affirmative grunts in the room. I asked for discussion; Why do we hate roundabouts? If we forgo standard intersections, the 27th Street Commission has estimated a $10 million savings in signage costs. Ted Grintjes pointed out that asphalt costs go waaay down because turn lanes are eliminated. Economic impact of roundabouts on local business is generally good. For instance, they allow for a direct left turn into a business that would otherwise be accessible only by a "Texas U-Turn" or "Texas Turnaround" (driver bypasses intersection for a left U-turn back to the destination; this is a legal and designed turn configuration that doesn't bode well for businesses nearby). The superior safety and lower congestion of roundabouts has long ago passed "theory" into FACT. Chairman Skowronski, once again, indulged my request. He commented that in his experience "roundabouts are a disaster," citing some specific roundabouts that he'd driven through. However, the gist of what he had to say contradicted the known data (upon which the federal and state DOT's have placed enough confidence that they strongly encourage roundabouts whenever possible): he cited "confusion," "slow-downs," "congestion," etc. Commission members wondered how pedestrians would know how to cross without a forest of signs; once again, Ted Grintjes brought to bear his experience in Europe (where roundabouts are already common) as he sought to explain an admittedly nonintutive concept: Street architecture such as roundabouts create a safer environment for pedestrians through curb extensions and easy-to-reach crossing islands as well as a design-enforced vigilance on the part of vehicle drivers toward pedestrians that does NOT exist in traditional intersections. A sign can't do that. As I picked up the thread and explained further, eyes rolled and tongues clucked (one member seemed to be laughing at me). Silly man: We just want to drive fast and unimpeded. But no one could explain to me how speeding cars through Franklin at ever faster velocities would help local businesses and attract economic development. They just seemed irritated at roundabouts and how they may slow your progress. It only gets dicier in part 2 (later today), but ends on a good note in part 3 (tomorrow). Is this any way to build roads? Designed for SPEED - with a path emerging from a public park directly onto to a blind curve? You can't fault the NIMBY (Not In My BackYard) reflex that is present in the average person. It's just human nature. The starkness of that reflex can still be disconcerting; it was manifested at this past Tuesday's special Common Council meeting immediately following discussion of the controversial 51st street widening north of Rawson. The room virtually emptied once it became clear that the issue had been put to rest. Next on the agenda: How to address 51st street in front of Franklin High School. The room emptied before that topic got underway. It's not your backyard. Just your children. Still, it was heartening to hear a common thread in citizen's comments (and then echoed by council members): Franklin needs to reassess its priorities and start making this city accessible to people rather than simply vehicles. Unfortunately, the stimulus application is limited to work on collector-level streets, and the collector-level streets here are already past redemption: wide and speed-inducing, there is no room for adding a proper, segregated bike and pedestrian lane without acquiring land, which also disallows a stimulus application. The feared and despised four-lane possibility on 51st north of Rawson was also disallowed, making the mayor's veto of that project moot. Nonetheless, there was a vote on sustaining the veto - - which two aldermen chose inexplicably to vote against. Sometimes logic is left at the door of common council meetings. Chosen instead for inclusion in the stimulus application is the stretch of 51st street in front of Franklin High School, site of many, many crashes and a tragic pedestrian fatality a few years back. Council upholds 51st Street veto - FranklinNOW. Tonight's Special Council Meeting (6:30 pm at the resplendent and huge Franklin Law Enforcement Center) does not - repeat: does not - include any vote to include in Franklin's stimulus/sprawl request the much-hated widen-51st-north-of-Rawson idea. So neighbors who are coming ready to rant about that project should be so advised. Turns out the project has parameters that fall outside of stimulus requirements. So the mayor's veto is moot - though discussion of same still appears on tonight's agenda. Discussion will be regarding the three remaining lipstick-on-a-pig projects, including a re-do of 51st in front of the High School - - and the council is actually considering an option with, once again, no sidewalks. Time is short, take it or leave it, etc. "And now we'd like to walk to your local coffee shop for further discussion. Surely you have a coffee shop in walking distance of your public library, right?" Feingold, Ryan unveil line item veto plan at Franklin Library - JSOnline.